Background: Worldwide, mental illnesses are on rise. There is an acute shortage of psychiatrists. Young medical graduates find psychiatry specialty a less attractive career option. The present study was conducted to find out attitudinal change of medical graduates to psychiatry specialty after their clinical posting. Methods: The study was carried out in a tertiary medical care centre situated in eastern Maharashtra in a rural setting. The medical graduates undergo rotation which includes clinical posting in psychiatry while they are in second year. One hundred medical students were administered Attitudes Towards Psychiatry-30 (ATP-30) questionnaire at the beginning and the end of two weeks of posting. Results: The response rate was 93% and the mean pre-rotation score on ATP-30 questionnaire was not significantly different as compared with the mean post-rotation score [107 ± 11.7 (SD) vs. 106 ± 12.4 (SD); (p=NS)]. Subgroup analysis revealed a significant decline [56 ± 6.4 vs. 54 ± 6.6 (p< 0.05)] in attitude on 15 positive questions of the questionnaire. Students with urban background [(55.8 ±6.6 vs 58.6 ± 9.3 (p=0.88)] as compared with rural background [58.1 ± 3.2 vs 53.9 ± 6.1 (p=0.03)] had significantly more decline on ATP-30 questionnaire. Conclusions: Overall, there was no change in medical students' attitude following two weeks clinical posting. Based on these findings medical curriculum including duration and frequency of clinical posting in psychiatry during undergraduate training requires change. All branches in the field of medicine are equal parts of art and science. However, when we consider psychiatry, which is the branch of medicine dealing with the mental ill, it is perhaps more art than science. According to the World Health Organisation (WHO), mental health can be defined as 'a state of well-being whereby individuals recognise their abilities, can cope with the normal stresses of life, work productively and fruitfully, and make a contribution to their communities'. In the global burden of disease (GBD) report (2010) of the WHO, substance use disorders and mental disorders ranked among the leading causes of overall disease burden. These accounted for 7.4% of global disability-adjusted life years (DALYs) and 22% of global years lived with disabilities (YLDs). There is an ever-increasing gap between the individuals who require treatment for their mental illness and the provision of such treatment. In the middle- and low-income countries, as many as 76%–85% of individuals suffering from severe mental illnesses, do not receive proper mental health care. For the high-income countries, although the numbers are a little better, they are still high between 35% and 50%. The need of the hour is to have more psychiatrists to cater to this increasing rate of mental illness which goes hand-in-hand with the current trends of stress and increasing day-to-day problems in everyone's social and personal spheres of life. It is not surprising that medical undergraduates, even before they are introduced to the subject of psychiatry in their curriculum, bear a similar feelings of stigma leading to degradation in their attitude towards psychiatry and eventually developing distaste for individuals suffering from mental illnesses and the physicians treating them. India, being a land of diversities brings about its own set of factors contributing to the ever decreasing number of psychiatrists. Chief among these are the negative stereotypes regarding psychiatry, poor financial gains and 'bad-mouthing' from peers from different specialities. Attitude, as defined by Oxford dictionary is 'a settled way of thinking or feeling about something'. Even before medical students start their training, their attitudes are influenced by the negative labels surrounding the field of psychiatry. They have either heard stories or seen movies where the psychiatric patient is depicted as someone with no chance of a cure and the attending psychiatrist making the case go bad to worse. The undergraduates are also oblivious to the numerous developments in recent years, both in terms of pharmacological options and prognosis in the field of psychiatry. However, all this contributes to a loss of interest as well as respect for the profession which finally culminates into less and less medical undergraduates choosing psychiatry as an option at post-graduation level. Adding fuel to the fire, the media and society labels cardiovascular surgeons or orthopaedicians, as the modern day 'rock-stars' of the medical world and choosing such fields are portrayed as money pots in the future. However, most of the celebrities around the globe suffer from some mental illnesses and this happens to be the best-kept secret. Hence, the task to change the mind-set of the medical undergraduates has to be taken up by the current handful of psychiatrists. Keeping this novel ideology in mind, the current study was conducted. In this study, the aim was to find out the impact of clinical rotation on the attitudes of medical students towards psychiatry. The study also attempted to find out the difference between the attitudes of female and male medical students, the difference if their background is rural or urban and to see if there are any differences if their parents are medicos or non-medicos. The present prospective study was carried out at Acharya Vinoba Bhave Rural Hospital, attached to Datta Meghe Institute of Medical Sciences, Sawangi (Meghe), which is a tertiary care hospital based in rural Maharashtra between 2016 and 2018. The study participants included 100 medical undergraduates who were posted for their psychiatry clinics for 2 weeks in different batches. The Institutional Ethics Committee approved the study protocol. The attitudes towards psychiatry-30 (ATP-30) questionnaire were administered before the beginning of their clinical posting ( first sample) after debriefing the aims and objectives of the study. The same questionnaire was re-administered at the end of their clinical posting of 2 weeks duration (second sample). A semi-structured pro forma was used to record socio-demographic variables. Burra et al. designed and validated ATP-30 questionnaire which is a 5-point Likert scale. There are 30 positively and negatively phrased items in this scale which are used to measure the strength of the respondent's attitude towards various aspects of psychiatry. There are five response options to the statements: 'strongly agree', 'agree', 'No opinion/neutral', 'disagree', 'strongly disagree'. Students who gave written informed consent, those belonging to 2015 MBBS batch, having 80% or more attendance in psychiatry clinics and who knew either English, Hindi or Marathi were included in the study. Students who did not give written informed consent, who opted for psychology in the 11th standard, those having attendance <80% and who did not know either English, Hindi or Marathi were excluded from the study. Data were recorded in a pre-designed pro forma and managed on Microsoft Excel spreadsheet (Microsoft Corporation, Richmond, USA). Categorical variables such as gender etc., were summarised as frequencies. Quantitative variables such as age, ATP score were summarised as mean ± standard deviation. McNemar's Chi-square test was used to compare change due to clinical posting in the categories of items measured on Likert scale. Paired t-test was used to compare change in mean ATP-30 scores for total (30 questions), negative (15 questions) and positive (15 questions). Student's t-test was used to compare differences between various subgroups of participants' characteristics. A value of P < 0.05 was considered to be statistically significant. The statistical software STATA version 14 (StataCorp LLC, Texas, USA) was used for data analysis. Between 2016 and 2018, 100 medical graduates were contacted to participate in the study. Ninety-three of them returned the duly filled in questionnaires (response rate: 93%). Their socio-demographic characteristics are shown in [Table 1]. The mean age of participants was 20 ± 0.78 years; there were 53 females (p = NS). A higher proportion of participants' parents had non-medical profession (88.2% vs. 11.8%) and most participants belonged to the Hindu religion (81.7%) and had nuclear family (78.5%). [Table 2] shows the descriptive statistics for the ATP-30 questionnaire for the 93 study participants. It shows the median and the first and third interquartile for the ATP-30 score relating to the positive, negative and total questions at the time of pre- and post-rotation. [Table 3] shows the effect of clinical posting on attitude towards psychiatry in 93 study participants on the 15 positive questions, 15 negative questions and the total 30 questions on the ATP-30 questionnaire. Subgroup analysis revealed a significant decline (56 ± 6.4 vs. 54 ± 6.6; P < 0.05) in attitude on 15 positive questions of the ATP-30 questionnaire. The relationship between socio-demographic variables of the study participants and the total 30 questions, 15 negative and 15 positive questions of ATP-30 questionnaire is summarised in [Table 4]a, [Table 4]b and [Table 4]c respectively. Participants whose father was a medico had a decline in mean ATP-30 score post-rotation as compared with those whose father was a non-medico (109.5 ± 10.8 vs. 105.3 ± 13.3, P = 0.09) [Table 4]a; however, this difference did not achieve statistical significance. 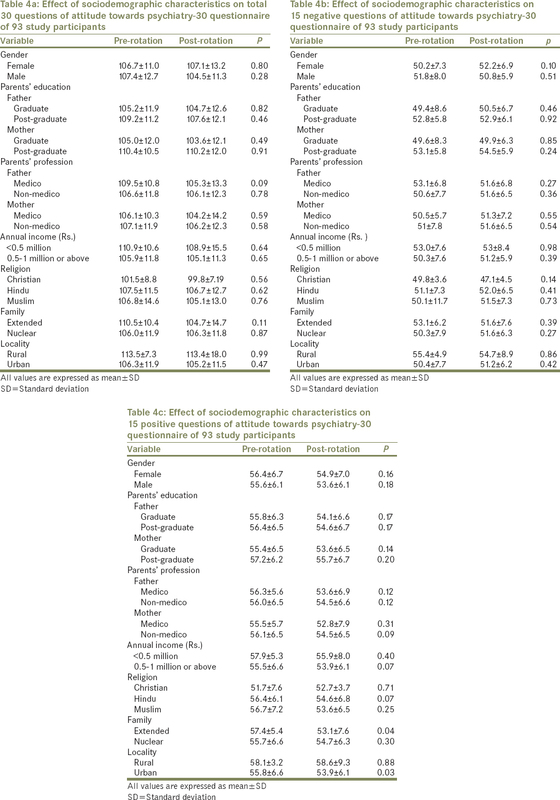 There was no statistically significant relationship between the socio-demographic variables of the study participants and 15 negative questions of the ATP-30 questionnaire [Table 4]b. Students with urban background (55.8 ± 6.6 vs. 53.9 ± 6.1; P = 0.03) had significantly more decline on ATP-30 questionnaire as compared with rural background (58.1 ± 3.2 vs. 58.6 ± 9.3; P = 0.88) [Table 4]c. A similar declining trend was observed under the headings of the Hindu religion (P = 0.07), income (per annum) of Rs. 0.5–1 million or above (P = 0.07) and mothers' profession as non-medico (P = 0.09); however, this difference did not achieve statistical significance. There was no statistically significant difference in the effect of other socio-demographic variables on attitude pre- and post-rotation. In [Table 5], changes in opinion at the time of pre-rotation and post-rotation evaluation are depicted as a negative change, no change or positive change among the study participants for each of the 30 questions of the ATP-30 questionnaire. A statistically significant change was evident for question 2 (P = 0.007), question 6 (P = 0.02), question 9 (P = 0.02), question 12 (P = 0.01), question 14 (P = 0.04), question 15 (P = 0.002), question 18 (P = 0.008), question 20 (P = 0.004), question 25 (P = 0.04) and question 28 (P = 0.02). A trend towards change was seen for the questions 5 (P = 0.08), question 7 (P = 0.08), question 17 (P = 0.09), question 27 (P = 0.09). Non-significant change in attitude was evident for the rest of the questions. According to the GBD report 2017, the five leading causes of YLDs in 2016 were a migraine, major depressive disorders, low back pain, iron deficiency anaemia and age-related and other hearing loss. There was a 2.7% decrease in age-standardised rate of YLDs for all causes combined between 1990 and 2016. Despite this, the absolute number of YLDs from non-communicable diseases has been rising fast across all socio-demographic Index quintiles and this can be attributed to population growth and the ageing of populations. In women, the main conditions contributing to higher YLDs rates were iron deficiency anaemia, anxiety, migraine, major depressive disorder, Alzheimer's disease and other dementias and all musculoskeletal disorders apart from gout. On the other hand, men have higher age-standardised rates of diabetes mellitus, cancers, substance use disorders, cardiovascular diseases and all injuries apart from sexual violence. According to this report, much less geographical variation in disability was observed worldwide. As stated in the Report by the Secretariat (WHO), depressive disorders would be the leading causes of disease burden globally by the year 2030. Even in the current trend, it is well recognised that the burden of mental health diseases is increasing worldwide and there is a severe shortage of psychiatrists both in developed and developing nations, thus creating a mismatch between population seeking psychiatry advice and service providers. Students whose fathers were medical doctors showed a negative trend (P = 0.09) on their score on total 30 questions of ATP-30 questionnaire. The result could have been statistically significant with larger sample size. The reason for such a tendency could be the fact that fathers who were practicing medicine harboured the same negative attitude and low social standing towards psychiatry as prevalent in society, in general. They would negatively influence their children's decision in choosing psychiatry as a career option. 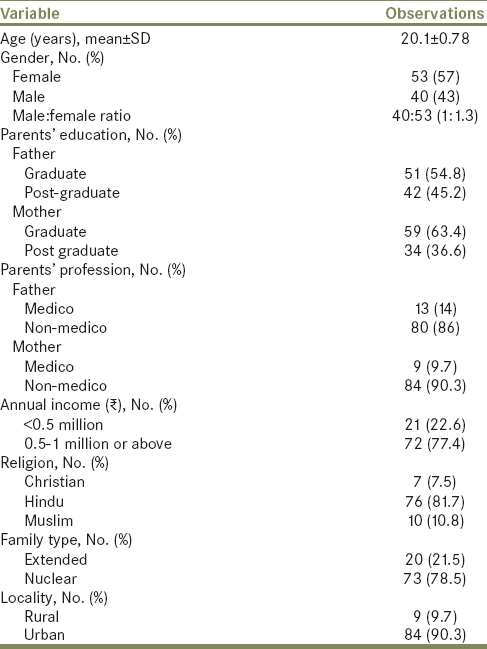 Medical students with non-medico mothers (P = 0.09), family annual income >0.5 million per annum (P = 0.07) and Hindu religion (P = 0.07) showed a negative trend. These results probably could have been statistically significant with larger sample size. From the aforementioned description, it seems that the family members played a major role in opting against this speciality which can be attributed to the fear of lowering the prestige of the family in the society.,, Similarly, the negative trend among students with non-medico mothers reflects the greater negative influence of the lack of knowledge about psychiatry on choosing this speciality as a career option. The reason for a negative trend among medical students with the Hindu religion background could be due to their strong belief in 'faith healers' for 'curing' mental disorders without using any psychotropic medications. Analysis of the response to the question 'on the whole, people taking up psychiatric training are running away from participation in the real medicine' of the ATP-30 questionnaire, revealed significant disagreement with the statement (32% negative change vs. 23% positive change, P < 0.02). This shows that a majority of the students probably had a positive view regarding psychiatry as a speciality due pre-clinical exposure to didactic lectures in psychiatry. With regard to the questions 'psychiatric teaching increases our understanding of medical and surgical patients' and 'psychiatric illness deserves at least as much attention as physical illness' of the ATP-30 questionnaire, the changes after clinical rotation were statistically significant (32% showing positive change while only 14% showing negative change, P = 0.02; 23% positive change and 6% negative change, P = 0.01, respectively). These results can be attributed to a transient positive attitudinal change, which probably wanes over a period of time when the students enter other clinical rotations as observed in other studies.,, A similar temporary positive attitudinal change was observed for the question 'With the forms of therapy now at hand, most psychiatric patients improve' on the ATP-30 questionnaire (27% positive change and 20% negative change, P = 0.04). To the question 'psychiatrists tend to be at least as stable as the average doctor' on the ATP-30 questionnaire, a significant change was noted (negative change of 33%, positive change of 22%, P = 0.002). The clinical posting was not able to bring about a change in this thought process of the medical students. Similar results have been reported in several other studies.,, For the question 'psychiatric hospitals have a specific contribution to make to the treatment of the mentally ill' on ATP-30 questionnaire, a statistically significant change was seen (negative change 26%, positive change 17%, P = 0.004). This might reflect that psychiatric doctors are not considered as proper role models. Analysis of the response to the question 'in recent years, psychiatric treatment has become more effective' revealed statistically significant result (negative change seen was 15% and positive change 30%, P = 0.04) which can be attributed to the increase in knowledge of medical students towards psychiatry and psychiatric disorders, without affecting their overall attitude. It cannot be commented whether this increase in knowledge is due prior clinical psychiatry lectures or due to the teaching during the clinical posting in psychiatry. The strength of the present study was the administration of the ATP-30 questionnaire with a response rate of 93%. The limitations include the lack of long-term follow-up to see if this positive attitude towards psychiatry sustains throughout their undergraduate course and whether students actually choose psychiatry as a career option. Another limitation in this study is the absence of actual testing of change in knowledge about the speciality of psychiatry among the medical undergraduates after completion of their 2 weeks clinical posting. Sadock B, Sadock V, Ruiz P. Kaplan and Sadock's Comprehensive Textbook of Psychiatry. 10th ed. Philadelphia: Wolters Kluwer Health; 2017. World Health Organization. Investing in Mental Health. Geneva: World Health Organization; 2003. Whiteford HA, Ferrari AJ, Degenhardt L, Feigin V, Vos T. The global burden of mental, neurological and substance use disorders: An analysis from the global burden of disease study 2010. PLoS One 2015;10:e0116820. World Health Assembly. 65 Global Burden of Mental Disorders and the Need for a Comprehensive, Coordinated Response from Health and Social Sectors at the Country Level: Report by the Secretariat. Geneva: World Health Organization; 2012. Feifel D, Moutier CY, Swerdlow NR. Attitudes toward psychiatry as a prospective career among students entering medical school. Am J Psychiatry 1999;156:1397-402. Gulati P, Das S, Chavan BS. Impact of psychiatry training on attitude of medical students toward mental illness and psychiatry. Indian J Psychiatry 2014;56:271-7. Oxford Dictionary. Available from: https://www.en.oxforddictionaries.com/definition/attitude. [Last accessed on 2018 Jul 19]. Burra P, Kalin R, Leichner P, Waldron JJ, Handforth JR, Jarrett FJ, et al. The ATP 30-a scale for measuring medical students' attitudes to psychiatry. Med Educ 1982;16:31-8. GBD 2016 Disease and Injury Incidence and Prevalence Collaborators. Global, regional, and national incidence, prevalence, and years lived with disability for 328 diseases and injuries for 195 countries, 1990-2016: A systematic analysis for the global burden of disease study 2016. Lancet 2017;390:1211-59. Ngui EM, Khasakhala L, Ndetei D, Roberts LW. Mental disorders, health inequalities and ethics: A global perspective. Int Rev Psychiatry 2010;22:235-44. Tharyan P, John T, Tharyan A, Braganza D. Attitudes of 'tomorrow's doctors' towards psychiatry and mental illness. Natl Med J India 2001;14:355-9. Shalaby AS. 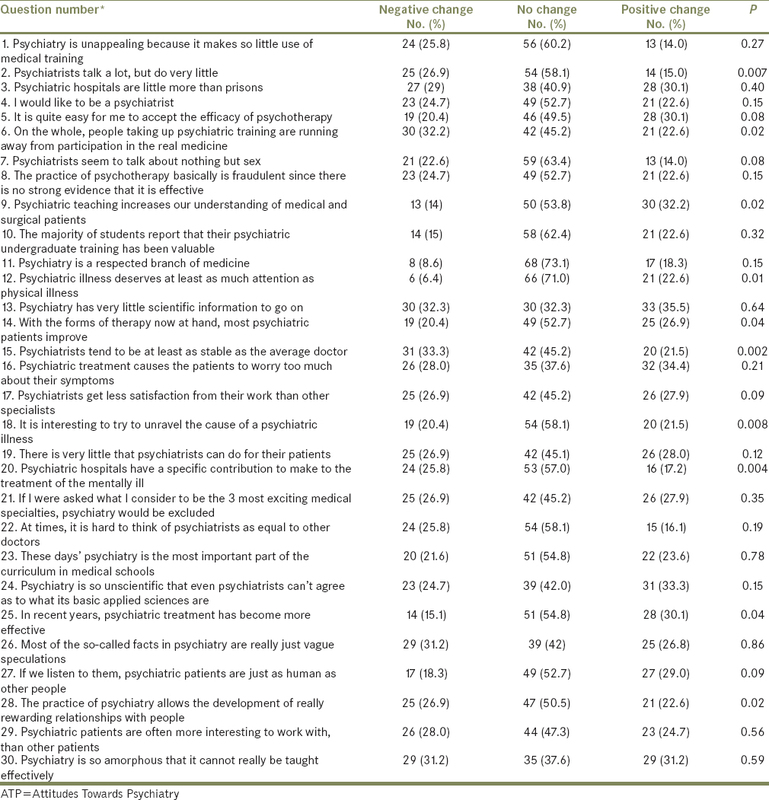 Attitude of an Egyptian sample of medical students toward psychiatry in comparison to previous studies using the attitudes towards psychiatry (ATP-30) questionnaire. Acad Psychiatry 2016;40:213-7. Alpaslan AH, Kocak U, Coskun KS, Ozbulut O, Yesil A. Attitude towards psychiatry and its possible association with alexithymia among medical students. J Mood Disord 2015;5:157-63. Aghukwa NC. Attitudes towards psychiatry of undergraduate medical students at Bayero University, Nigeria. S Afr J Psychiatry 2010;16:a239. Garg R, Shah S, Kataria L, Sharma D. Impact of psychiatry postings on attitudes towards mental illnesses and psychiatry – A comparative study done on medical and nursing students. EJPDCR 2013;2:140-4. Aruna G, Mittal S, Yadiyal MB, Acharya C, Acharya S, Uppulari C. Perception, knowledge, and attitude toward mental disorders and psychiatry among medical undergraduates in Karnataka: A cross-sectional study. Indian J Psychiatry 2016;58:70-6. Rajagopalan M, Kuruvilla K. Medical students' attitudes towards psychiatry: Effect of a two week posting. Indian J Psychiatry 1994;36:177-82. Sarker MR, Khan MZ, Jahan N, Maruf MM, Chowdhury MW, Hamid MA, et al. Attitudes towards psychiatry among undergraduate medical students. Bangladesh J Psychiatry 2017;28:45-9. Scull A. Cultural Sociology of Mental Illness: An A-Z Guide. Vol. 1. Thousand Oaks: SAGE Publications; 2014. p. 386. O'Connor K, O'Loughlin K, Somers C, Wilson L, Pillay D, Brennan D, et al. Attitudes of medical students in Ireland towards psychiatry: Comparison of students from 1994 and 2010. Psychiatr Online 2012;36:349-56. Mortlock AM, Puzzo I, Taylor S, Kumari V, Young S, Sengupta S, et al. Enrichment activities in the medical school psychiatry programme-could this be a key to engaging medical students in psychiatry? A study from a high secure forensic psychiatric UK hospital. BMC Psychiatry 2017;17:83. Chandrasekaran R, Joshua E, Rasamy G. Impact of psychiatry training on attitudes of undergraduate medical students. Malays J Psychiatry 2008;17:326-32. Roberts LW, Bandstra BS. Addressing stigma to strengthen psychiatric education. Acad Psychiatry 2012;36:347-50. Holmes D, Tumiel-Berhalter LM, Zayas LE, Watkins R. “Bashing” of medical specialties: Students' experiences and recommendations. Fam Med 2008;40:400-6. Stampfer H. The recruitment problem in psychiatry: a critical commentary. Educ Res Perspect 2011;38:1-18. Khokhar MM, Luqman M, Ahmad A, Khaliq T. Impact of constructive feedback on the undergraduate medical students' attitude towards psychiatry. Pak Armed Forces Med J 2014;64:259-64. Khajeddin N, Riahi F, Salehi Veysi M, Hoseyni H, Izadi Mazidi S. Do medical students' attitudes toward psychiatry and their intention to pursue psychiatry as a career change during psychiatric attachment? Iran J Psychiatry Behav Sci 2012;6:53-61. Kuhnigk O, Hofmann M, Böthern AM, Haufs C, Bullinger M, Harendza S. Influence of educational programs on attitudes of medical students towards psychiatry: Effects of psychiatric experience, gender, and personality dimensions. Med Teach 2009;31:e303-10.